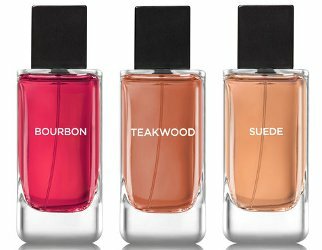 Bath & Body Works has launched a new fragrance collection for men. Noir and Ocean are reintroduced in new packaging, new for 2017 are Bourbon, Teakwood and Suede. Bourbon ~ "Cozy up to this bold, spicy blend of white pepper, dark amber & Kentucky oak." Teakwood ~ "Take an entrancing walk through the woods with this striking blend of mahogany, black teakwood & lavender." Suede ~ "Project confidence with this classic combination of smooth suede, warm cedar & oakmoss." Bath & Body Works Noir, Ocean, Bourbon, Teakwood and Suede are available in 100 ml Cologne ($34.50) and in a variety of grooming products. Nice modern packaging, reminds me of Zara. They are much nicer than the 2010 iteration. But for real though, gonna give these a sniff after work! Well, they sound nice, but I bet they have that musk base they they started using a few years ago in everything. I haven’t been able to tolerate much of anything they’ve released in the past 3 or 4 years. I regularly buy their vintage edts on ebay when the price is right, though. Bottles look nice, price is great…will definitely give these a sniff. I´m gonna file this under #giftables for my trip to the US later this year!